Updating an Entry Way and a Gallery Wall..
I’ve been working the last few weeks on updating my entry way. It was the first room I decorated when we moved into our home more than 10 years ago. The first thing I did 10 years ago was to paint my entry walls in a two-part Ralph Lauren leather wall/glaze technique that required a lot of patience and a few adult beverages. So anyway, this wall is kind of symbolic to me for the above reasons. We chuckle about it now and I went on to finish the whole thing myself, which really makes the wall special to me. However, I have been torn as I have been working on the room about repainting the entry way or not. Dear husband says he’s ready for a change (hmmm, flashbacks?). My girlfriends are divided. Some say that I shouldn’t even think about painting it and some say I should have repainted it years ago. I was on the fence about the wall, so I decided to just start revamping the room to see if the modern touches really update the leather/dark wall. but when I received the tiles, there were so many different design possibilities, I just created my own that worked in my space! How cool is that! This product is such a fantastic concept that I did a whole post here with more details and an easy tutorial if you’re interested. You will not believe all of the choices that FLOR has to offer and I can’t wait to show you some of my favorites. If you missed the easy chalkboard on glass tutorial, you can find it here. I also added some gold leaf large letters that I picked up at Hobby Lobby for $5.00 each (they were 50% off). I loved them in black but decided to paint them cream to really stand out against my dark wall. I love orchids and wish that I had a green thumb so I could truly enjoy them. Instead, I have to get creative with really good silks and I did a post several months back on how I mix silk orchids with naturals to make them look real if you’re interested you can find it here. I still have a few more touches to add to my entry way but overall, I’m pleased with the updates in my entry way and I feel better about that dark leather wall. Sometimes by adding a few updated pieces, a room can really be transformed. I think bringing in the cream and the modern pieces really helped. I may still change the wall color down the line but for now, I think it works. 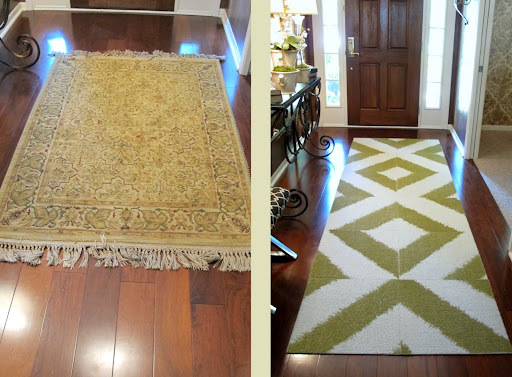 Don’t forget to check back on Monday for my post about my new rug and Flor carpet tiles. Also, tomorrow I am so excited to guest post on one of my very favorite blogs, Tatertots and Jello! If you have the chance, I would love for you to come visit me over there tomorrow. As always, thank you so much for your comments, emails and notes! I so love hearing from you and would love to know your thoughts about my leather wall! oh girl! I am loving that new rug!!! It really makes the space! Its all beautiful!! Your transformation looks stunning! 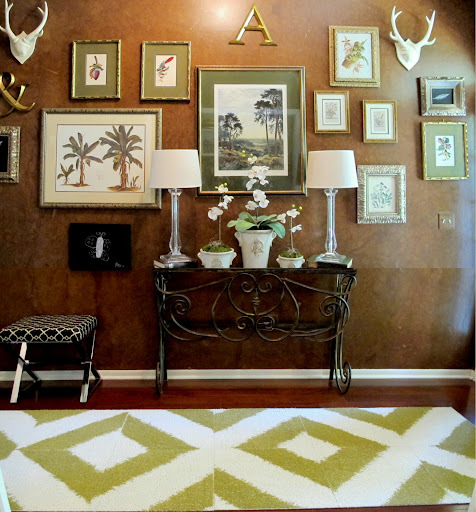 I am absolutely in love with your chevron carpet tiles. The pattern you created is fabulous and as a piece, it lightens and brightens the space so much. Love everything about this not the least of which is that fabulous wall. Glad you can laugh about it now. That rug is wonderful, heck, all your stuff is great. Thank you SO much ladies!! The rug is even more spectacular in person I have to say! I can't stop walking by and looking at it! The same rug comes in 5 different colors too. The one in colbalt is over the top! Have a great night ladies and thank you again so much! Your husband must be my husband's 'soul brotha'. I remembering wanting that leather look, but not having the patience to do it. Like all the palm trees, etc. on the gallery wall. This is just beautiful! 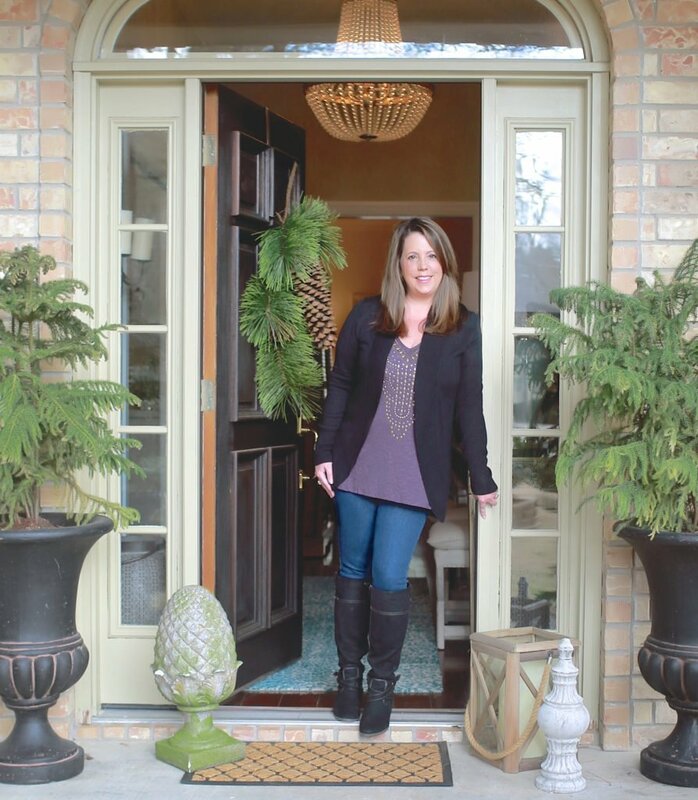 Love the rug…it makes the entry! Thanks for sharing! Those tiles are fabulous. Thanks for sharing your source. Your entry looks beautiful! Wow! There are so many wonderful ideas in this post. I adore your new area carpet and can't wait to learn more. I like you pattern way better than the ad. Thank you for sharing your story about painting with the Hub. I did a similar wall treatment ALONE and have a few dry edge marks. I also did it 10 years ago in an effort to cover up little finger marks left on the flat wall finish. I learned quickly that flat wall paint and kids do not mix. No matter what others say I think its very well thought off I must say the Chairs are Nice, as well as the Rugs and there`s no chance of missing that amazing paint job Keep it up I a loving it……!!! I think it looks very elegant! Love your gallery wall; I'm hoping to do one myself once we are in our new place. I have a wall in my entry way that's desperately in need of becoming a gallery wall. Thanks for the inspiration! Your space looks amazing. First thing that grabbed me was that fab carpet. I love the way you put it together. (even more then the display!) It is the jewel of the room. Great choice. You had me giggling over the get a move on it discussion you had with the hubby. So true, a girlfriend would just get it in gear. Why IS that? Great post. Loved it. Have a wonderful weekend. Your wall looks fantastic! I try to avoid projects with my husband…enough said. It's just better that way. Enjoyed your story. OK, first. Your painting story with hubs made me totally crack up! But seriously this entryway is AMAZING and you have so many incredible ideas and inspiration in one post! And I really like your version of that rug better then the original! SO PRETTY! I love the new look of your foyer. By keeping the walls as they already were, it now looks very updated Ralph Lauren'ish! That's a good thing! Take care. Beautiful! I had to read the couple paragraphs aloud to my husband about working with yours… and he just kept saying…sounds like you. Love it! Love the fact that you have enough guts to actually publish it! Thanks! Cyndy, this room, OMG, is so awesome. Your style is beautiful.. and the leather treatment, WOW stunning, I know you might want a change, I completely feel your struggle..You and I would have so much fun together. it looks fantastic!!! love that rug! 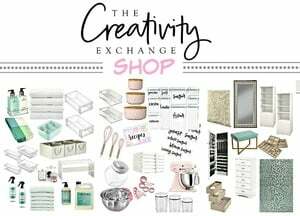 I just read your blog for the first time last night and love it! I ladore the chevron rug and have requested a catelog from Flor. I was not able to get to your link for another post with details and a tutorial. I went to Hobby Lobby today to get your antelors, but they had nothing like it. I spoke to the manager who suggested I go online to check, but nothing else there, unless I didn’t look in the right areas. I checked out the cowby and Native American categories. If you have any suggestions, I would love to hear them! When did you find your antelors? Thanks for sharing your great style!